Hippos gather near a pool during the wet season. Photo by Keenan Stears. The average hippo weighs more than 3,000 pounds and consumes about 100 pounds of vegetation daily. This naturally results in large quantities of dung being deposited into the rivers and lakes where hippos spend their days. In general, the nutrients delivered via hippo dung to such aquatic ecosystems are perceived to be beneficial. For millennia, they provided a natural source of fertilizer that appears to fuel life in aquatic food webs. That may be changing. In sub-Saharan Africa, deforestation, water-intensive agriculture and now climate change are significantly altering water cycles and causing many rivers to begin to dry. A new study from Justin Brashares and Todd Dawson, and integrative biology professor Mary Power, with colleagues at UC Santa Barbara and Sokoine University of Agriculture in Tanzania, examines how these forces of global change are redefining the way hippos—and their dung—shape the ecology of freshwater ecosystems. The findings appear in Proceedings of the National Academy of Sciences. 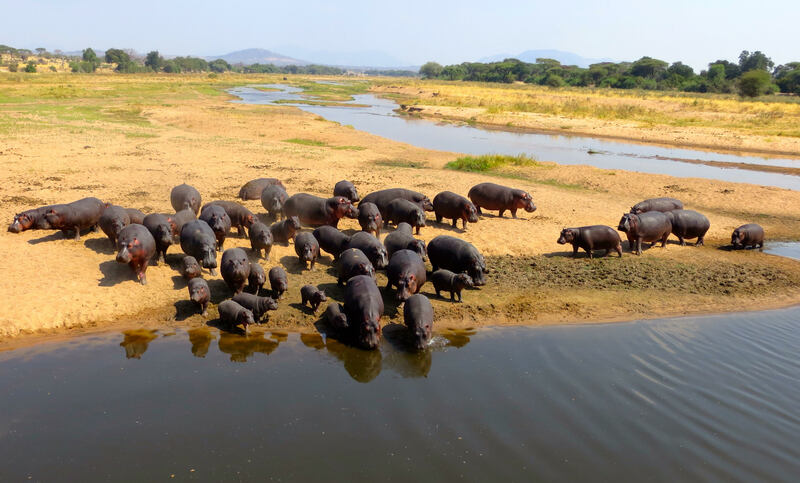 The researcher team studied river flow and hippo density in the Great Ruaha River in Tanzania’s Ruaha National Park, which protects an area about the size of Connecticut and is home to large populations of some of Africa’s most iconic species. The Great Ruaha River is the backbone of life in this dry region. Since 1993, however, the once constantly flowing river has ceased to flow during the dry season. The researchers tested nearly a dozen attributes of water quality and measured the diversity and abundance of aquatic life in hippo pools over multiple years, both when river flow was high and during dry periods when the river stopped flowing. Only a few species of fish and insects are able to survive in the hippo pools when the river dries, because of extreme losses of dissolved oxygen in these pools. Stears and his colleagues noted large reductions in fish diversity and abundance inside the pools that were over fueled by dung when river flow ceased. According to Stears, the findings from this study highlight the value of accelerating more efficient water-management policies and land-management practices not only for the conservation of hippos but also to ensure the sustained health and functioning of African watersheds in a changing environment. Read the story at its source, UC Santa Barbara.